Open Remote Application Server Console, click Connection in the sidebar, and click the Second Level Authentication tab. Check Enable second level authentication and click the Settings button to open your Deepnet settings. Enter the server name and port that you saved while setting up your Authentication Sever. By default the port number is set to 8080. Click Check Connection to test that your Authentication Server can be reached. You can choose to connect over SSL to your Deepnet server. 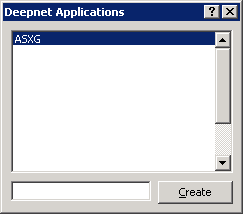 Select the application profile that will use Deepnet to authenticate its users. 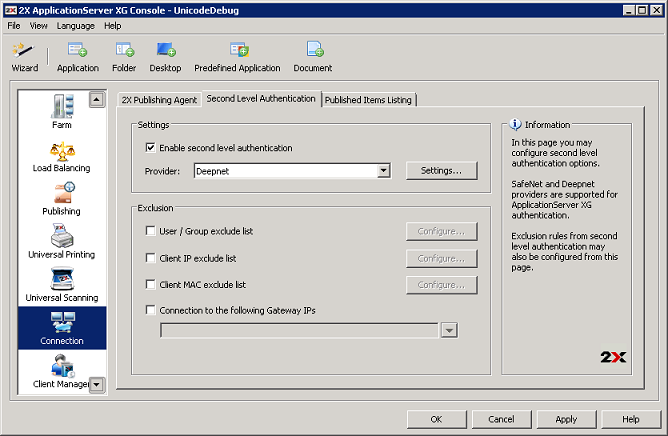 From the above dialog you can choose the application used by Remote Application Server for authentication. You can also create an application, which will be added on the Deepnet server. The Default Domain lets you choose the default domain user for authentication and when users are added. Any Deepnet user accounts imported or verified are done so using this default domain. LDAP must be used when importing Deepnet user accounts and a group that contains other sub-groups. Import Deepnet user accounts automatically adds the specified users or groups into the Deepnet application. 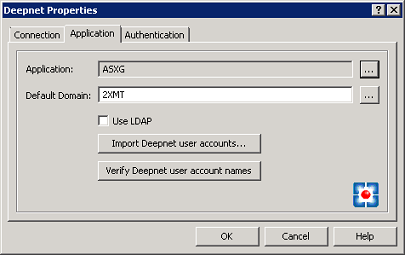 Verify Deepnet user account names checks that all the users in the Deepnet application are in the following format: \domain\username. Users added in the format of username@domain are automatically changed to the appropriate format, and users without a domain are assigned the default domain. Select the mode in which you want your users to be authenticated. Mandatory for all users means that every user using the system must log in using two-factor authentication. Create token for Domain Authenticated Users allows Remote Application Server to automatically create software tokens for Domain Authenticated Users. Choose a token type from the drop-down list. Note that this option only works with software tokens. Use only for users with a Deepnet account allows users that do not have a Deepnet account to use the system without having to log in using two-factor authentication. From the Allow Channels section, you specify which channels are available to the user to activate the token or when requesting a Quick ID OTP. For example, if you select Email, as the Allow Channel, the activation code can be sent only via Email, as shown below. Likewise, if the Allow Channel selected is set to SMS, the activation code is then sent via SMS. 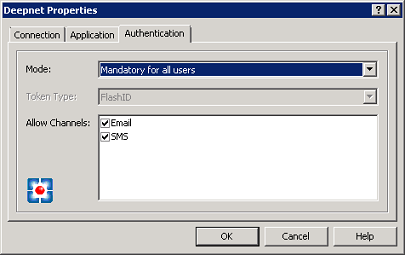 The following diagram is an example showing how the activation code is sent via email when the Allow Channel is set to use Email.